The Anaheim Ducks are in need of more and more young offensively gifted players as they attempt to transition to a more effective speed-and-skill-based game. 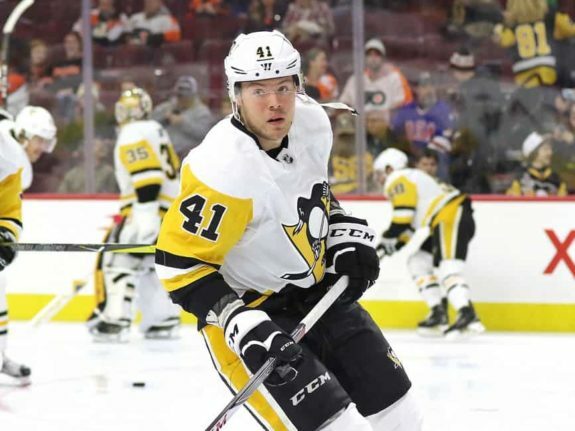 Last week, recently-extended general manager Bob Murray took one step towards that by acquiring talented right winger Daniel Sprong from the Pittsburgh Penguins in exchange for defenseman Marcus Pettersson. In just three games with his new team, Sprong has already been a significant contributor, picking up a goal in his Ducks debut on Dec. 5 as part of a 4-2 win over the reeling Chicago Blackhawks, and then a shootout tally in a wild 6-5 victory over the New Jersey Devils Sunday night. While the wins have been more plentiful lately, the Ducks’ uneven play this season pointed to a need to continue to stockpile young offensive talent. Murray’s acquisition of the 21-year-old Sprong, a second-round pick of the Penguins in 2015, fits this vision. The 22-year-old Pettersson had shown promise as a steady defender, but he does not offer the upside that Sprong does, so even though Sprong is still unproven at the NHL level, it was the type of trade worth taking a chance on. Sprong found himself in head coach Mike Sullivan’s doghouse in Pittsburgh as he continued to try to refine his all-around game. But it became a vicious cycle of not being able to prove himself because of his limited ice time. He scored 32 goals and 65 points in 65 AHL games last season, so he had nothing left to prove except that he could succeed in the NHL. Upon arriving in Anaheim following the trade, Sprong expressed excitement at getting a fresh, new opportunity to showcase what he can do at the game’s highest level. Indeed, it’s been a big change for Sprong; he has seen at least 13 minutes of ice time in each game so far, spending a decent chunk of time playing with Adam Henrique and Nick Ritchie. He’s even gotten some time on the power play. The Ducks have won two of their three games since Sprong entered the fold. In both of those victories, the Amsterdam-born Sprong played a major role. He made an immediate impression in the first period of his first game in Ducks colors when he beat goaltender Corey Crawford from a sharp angle, roofing an absolute snipe to give the Ducks a 2-0 lead in a game they would eventually win by a final of 4-2. Crawford played the angle poorly, but Sprong still needed a perfect shot to score, which he delivered. Most recently, Sprong helped decide an entertaining, back-and-forth affair Sunday night when the Ducks played host to the Devils. He scored a shootout goal after utilizing a filthy shoulder fake to freeze goaltender Cory Schneider before going to his backhand for a pretty finish. His shootout marker allowed Ryan Getzlaf to seal the win for the Ducks when he scored in the third round. Sprong has been a catalyst for offense in his brief time in Anaheim; beyond his scoring highlights, he has attempted 14 shots in his three games since the trade. Ondrej Kase is the only Ducks player with more (20). Anaheim needs more players who look to shoot often, and Sprong helps them in that regard. Sprong’s early returns have illustrated the level of skill that has allowed him to put up excellent offensive numbers at every level of hockey so far in his career. The NHL is the final league for him to conquer, and the Ducks hope to see him do it with them.